The word ‘gratis’ is from Latin and it means “free”, “given or done for free of charge” or “out of kindness”. The word ‘basis’ means “a underlying support or foundation for an idea, argument, or process” or “a principle on which something depends”. 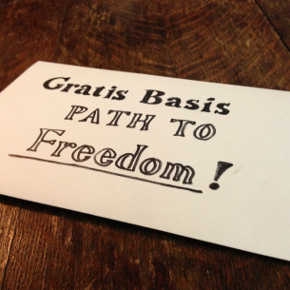 Gratis Basis is a fundamental principle based on values such as trust, abundance, cooperation, harmony and freedom, on which new ways of living – a new paradigm – can grow.